This site shows part of a collection of miniature portraits. For the Home page and links to American, European, and other British miniature portraits in the collection, please click on the links which appear when the page is fully loaded. Recently, A tiny enamel miniature by William Bishop Ford was added to the collection. But that has now been "exceeded" in miniature by a similar miniature of the same subject by William Essex (1784-1869). It is hard to give an impression of how small these miniature portraits are. 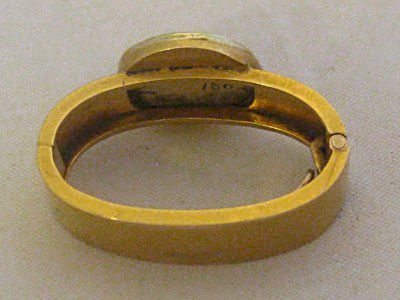 The Essex one is smaller and is only 11mm in diameter, with the Ford example being 16mm in diameter, about the size of a little fingernail. They are shown in a single image to show the relative sizes. 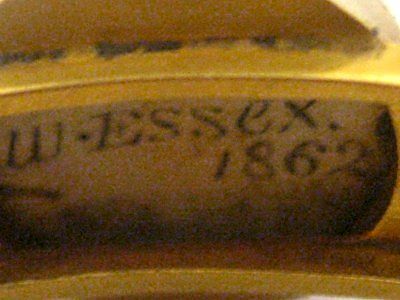 The Essex miniature is signed on the reverse "W Essex 1862" and was painted in enamel, probably onto a copper base. 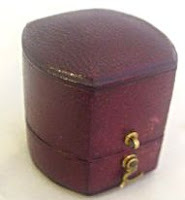 It is set into a small hinged band, perhaps for a lady's scarf or man's cravat. The band is housed in the original red leather box, which is unmarked. As with the Ford miniature, the dog depicted is "Impudence" originally painted by Sir Edwin Landseer. The Ford miniature is signed in the reverse "W B Ford 1866" and was painted in enamel directly on a gold base by William Bishop Ford (1832-1922). He was born in London 3 May, 1832, the son of Michael and Agnes Ford. 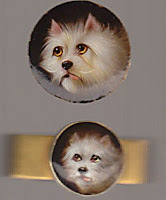 Ford was a student of William Essex who also painted miniatures of dogs and other animals. Many of the miniatures were worn set in tiepins or brooches, and they still exist in relatively large numbers. 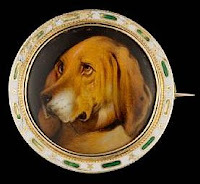 The Ford example is a delightful portrait miniature of enamel over gold of "Impudence" after the famous Landseer painting "Dignity and Impudence" (see also the portrait of Dignity below). 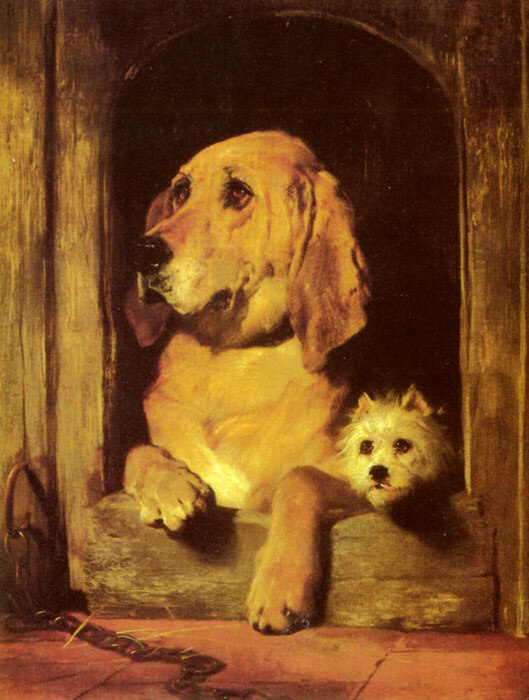 In the original, now in the Tate Collection, Landseer contrasts the large, dignified bloodhound with the small, mischievous terrier. These dogs, 'Grafton' and 'Scratch' were both owned by Landseer's friend, Jacob Bell, who commissioned the painting and bequeathed it to The Tate in 1859. In 1839, William Essex was appointed Enamel Painter in Ordinary to Princess Augusta, Queen Victoria and HRH Prince Albert. 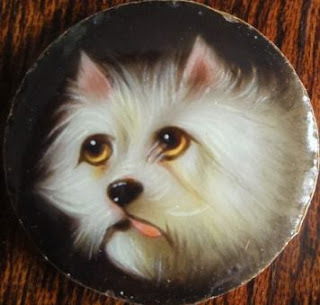 Queen Victoria was said to be greatly enamored by the Landseer painting, hence her enamel painter copied the West Highland White Terrier in miniature. Essex served as master for several artists, including Ford, who would become famous in their own rights. Essex's miniatures of dogs are highly sought after and very scarce. Although it is not of a person, I had wanted to have an example of one of these tiny miniatures in the collection, but the prices for such miniatures are so high, I could not begin to justify the expense for something so small. For example, although it did not sell, there was recently a similar sized miniature of a fox by William Essex for sale on eBay for $1250. "A lovely 14k gold and enamel pin by William Bishop Ford. Ford was a specialist painter of miniature enamels, he was a pupil and assistant of William Essex who was famous for his dog enamels. In 1839, William Essex was appointed Enamel Painter in Ordinary to Princess Augusta, Queen Victoria and HRH Prince Albert. Pin is in good condition. Measures 1 3/8" in diameter. Minor scratching. Gold not hallmarked. Bezel tested as 14k. Pin on the back tested as 9k. Signed and dated 1884. The dog's eyes will melt your heart. Item #6059 - $999.00"
At that price it would also melt your wallet! 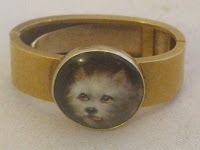 The Victorians believed that no house was a home without a dog or cat in residence and jewelry was often designed to include an image of a cherished pet. Here we have a classic example of a miniature enamel by William Bishop Ford. While not as well-known as contemporaries J. W. Bailey and William Essex, he was a specialist painter of miniature enamels and studied under Essex. He typically painted enamel onto porcelain, copper and gold and did work for the Minton porcelain company displayed at the 1885 Paris Exhibition. Against an enamel backdrop the color of dusty olive green, a carefully executed portrait of a Manchester terrier or Miniature Pinscher dog glows with rich shadings of mahogany-red enamel and black. Realistically rendered wedge-shaped head and v-shaped ears, the small oblong eyes clearly convey intelligence, a lively personality and undying loyalty. Even the texture of the sleek and shiny coat is apparent. The miniature has been set into a gold twisted wire mount. 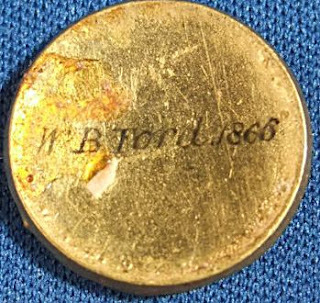 The pin is original and of gilded metal. Signed on the reverse “WB Ford 1873”. Thus, it was pleasing to buy this unset example on eBay for £90. It was obviously set as a tiepin at sometime in the past, as it has glue residue on the reverse, but even though the setting is missing, it is a representative example of his work. Additionally, it is the only miniature in the collection at this point which is painted on gold, which is the rarest ground for miniatures to be painted on. And with current gold prices, the purchase price may have only paid for the gold content! Ford exhibited at the RA and elsewhere between 1854-1895, so this item is right in the middle of that. He also painted on ivory and porcelain. 1421, 1444. In 2010 Bonham's auctioned this enamel brooch depicting a Blood Hound by William Essex, set with a green and white enamel border signed on the reverse 'W.Essex, 1864' It sold for $915 including commission. It is also taken from Landseer's 'Dignity and Impudence' painted in 1839 and now in the permanent collection at The Tate Gallery in London, so as Dignity it is the pair to Impudence. William Essex (1784-1869) is widely regarded as the best enamellist of his generation. He first exhibited at the Royal Acdemy in London in 1818. He was appointed enameler to Queen Victoria in 1839 and wrote at treatise on the art of enamelling. Most of his work is based on copies of the Old Masters or works by famous contemporaries such as Landseer and Winterhalter. Prices for the work by William Essex are all over the place. The vertical tiepin signed by Essex and dated 1863 has been for sale on the Internet for $2150. The horizontal tiepin of Impudence, also signed by Essex and dated 1863, has been for sale on eBay with an asking price of $6500!! At Philosophical magazine - Page 442 there is a detailed article by the brother of William Essex, Alfred Essex, who also painted in enamel, which gives considerable detail about the art of painting in enamel, titled, "Some Account of the Art of Painting in Enamel". 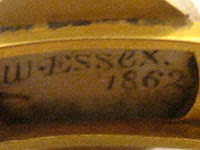 As indicated in the post, William Essex died in 1869. However, if you click on my profile you are welcome to send me an email of the inscription.